The Thurgood Marshall School of Law at Texas Southern University started when Heman M. Sweatt was denied admission to the University of Texas School of Law because he was black. Thurgood Marshall, who was then chief counsel for the NAACP Legal Defense Fund, successfully argued Mr. Sweatt’s case before the U.S. Supreme Court. Consequently, the Texas Legislature passed enabling legislation for an interim and separate law school for African-Americans as part of the “Texas State University for Negroes,” the name of which was changed in 1951 to Texas Southern University. The Law School was initially housed in Austin, Texas, but was subsequently transferred to Texas Southern University’s campus in Houston. Importantly, because it was deemed by some a “Jim Crow” institution, the Law School did not have the support of Thurgood Marshall or the NAACP. 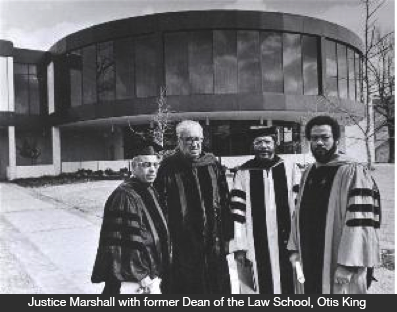 In 1978, however, now U.S. Supreme Court Justice Thurgood Marshall, agreed to name formally the "Law School of Texas Southern University," the "Thurgood Marshall School of Law." Thurgood Marshall School of Law has a proud legacy of producing leaders in the legal profession, business and public service. In the past five years, the Law School has been #1 in Texas for producing African-American attorneys and #3 in Texas for producing Latino attorneys. * Each year, the Law School ranks in the top five (5) in the nation in the number of African-American law graduates. In addition, it ranks in the top twenty-five (25) in the number of Mexican-American or Chicano graduates.